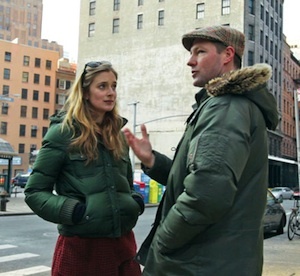 Last year saw indie stalwart Edward Burns work with his lowest budget since “The Brothers McMullen” and try his luck at a radical distribution model for the romantic comedy “Nice Guy Johnny.” This year, with his Tribeca Film Festival closing night film “Newlyweds,” Burns goes guerilla and asks for some help from his fans. With a shooting budget of $9,000, Burns latest venture marks his cheapest directorial outing to date. Working with a three-person crew, Burns had the actors wear their own clothes, do their own hair and makeup and shot without lights for the most part. He revealed all of this via Twitter to his followers. In keeping with his new interactive approach, Burns held a contest for people to submit potential poster art for the film on his personal website. The top three have been selected by popular vote through a Facebook voting system. Voting for the winner starts today and ends at noon Eastern Time on Monday, April 18th. Check back on indieWIRE later that day for the results. In addition, indieWIRE got exclusive word that Burns is reaching out to unknown musicians/bands to submit a song or two that will be used in two key scenes in the film. Burns is looking for a song with an acoustic, coffee-house sort of sound and another that has more of a dancey, indie-rock sound. To submit a track click here. The competition closes noon Eastern Time on April 20th. Winners will be announced April 22nd. indieWIRE caught up with Burns to discuss the reasons behind his new approach. Why make this latest project so interactive? It wasn’t really my intention. Last year when we released “Nice Guy Johnny,” I started using Twitter a lot and enjoyed the interaction with the fans. I would pick their brains periodically about what they liked about the film, music that they liked etc. As I started thinking about what I would do next, I started to get questions, asking what I was doing next. So I started to toss out the different ideas I was contemplating. Once I started to narrow in on this screenplay I threw the plot out there and I got a slew of responses. A response inspired one of the storylines in the screenplay. Once I did that I kept going back to them. I asked for character names. I asked them to help me to try and come up with one of the last lines in the film. Have you always had such a close relationship with your followers, or were you caught off guard by the wealth of responses? Living in New York, going out in bars and restaurants I had some interaction, but nothing like what you get on Facebook and Twitter. With your last film “Nice Guy Johnny,” you worked with your lowest budget since your first feature, but this marks your lowest one yet. Why did you go even lower this time around? We had such a good time not having to deal with any financiers and any kind of production people who would be connected to money. I knew on this film, I wanted to make it in the same style that we had made “Johnny.” The difference was we used a different camera this time – we used a Canon 5D, instead of the RED. It’s a smaller camera. We only used practical lights. Because the film is a pseudo doc we were able to go into locations in Tribeca. We said, “Look, you guys can stay open for business. We’re just going to go in the corner.” On a lot of days we didn’t even have a soundman. Nobody noticed us because we didn’t have a boom. We were able to shoot in these locations. Given the nature of the production, nobody charged us any fees. Have you been surprised by the quality of the posters? Kind of shocked. When I threw it out there I thought maybe I would get a handful of posters from a handful of art students. I never really thought that we would get the quality or as many as were submitted. Do you see yourself going down this route in the future? Depending on the film. I know I’ve been enjoying being able to communicate with the fans. It’s interesting because sometimes, you make a film you put it out there; like a lot of these smaller indie titles, they don’t get enough publicity. Even as a filmmaker, you feel, “God, did my film dissapear without a trace?” You discover through Twitter and Facebook that these films – they do have fans. It’s fun to check in with those fans and hear what they like about what you’re doing. So that’s been kind of fun, to engage with them. I think moving forward, I’m enjoying the process of having them collaborate. So yeah, I think I’ll continue to do it. What kind of distribution model are you envisioning for this film? We did so well financially on “Nice Guy Johnny.” We’re big believers that for a certain size feature film, theatrical makes no sense. I get to enjoy the theatrical experience with these films by going to film festivals, screenings for film socities and touring to film schools. I get that experience. But from a financial standpoint it makes zero sense. We really have no interest in theatrical. We do think there are a couple of tweaks we can make to the “Johnny” model. Just little slight adjustments. There’s no guarantte they could work. But I think there where areas where we missed an opportunity. The biggest missed one, was we thought it would be a good idea to go out the same time with all digital platforms and DVD. Now we’re better off holding off on DVD and releasing that later.